Chris Galvin - Who Were In The Lift But Survived The Accident At Barrow Pit, 1907? Frank Dobson was my great grandad. His son Albert, who was six years old when his father was killed, was my grandfather and Albert's son Walter was my dad. Albert had ten children, six sons, Frank, Walter, Albert, George, Derek and Jack and four daughters Doreen, Rita, Brenda and Rosie. He was married to Mildred Shaw who originated from Jump. They have now passed away and are now only survived by Doreen, Derek, Rosie and Jack. I am the oldest of four daughters of Walt who was married to Jean for 59 years before be passed away in 2009 aged 79 years. Frank was my great grandad. He is buried in St Peters old graveyard but the headstone as fallen over now. My mum told me his son Lawrence that morning said to his dad I will race you home for bread and drip and of course he never did come home. My grandfather Alfred Hollinshead was a winding engine man at Barrow for 20yrs. He was getting married to my grandmother on 16th November in London. The morning off the disaster Alfred lowered well-wishing colleagues down the shaft before leaving to travel to London, seven of these colleagues were killed at the end of the shift in the winding accident. Who Were In The Lift But Survived The Accident At Barrow Pit, 1907? On your excellent site you have the names of those who died when the pit cage at Barrow fell in 1907. I am trying to find a list of those who were in the lift but survived the accident and would be grateful if you could suggest any sources for this information. BARROW - Barnsley, Yorkshire. 15th. November, 1907. 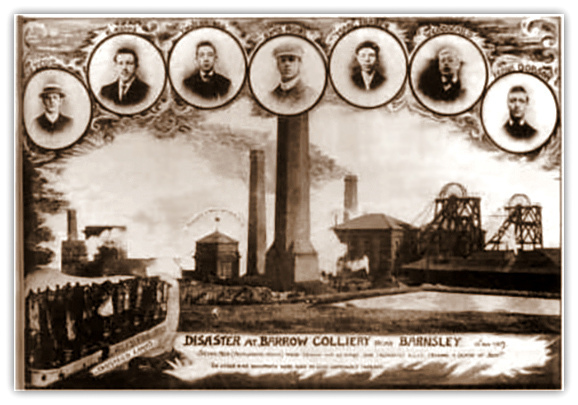 The colliery was owned by the Barrow, Hematite Steel Company, Limited and the cage accident caused the deaths of seven men. The shaft in which the accident occurred was 17 feet in diameter and was an upcast which was used exclusively for winding men to and from the Parkgate, Thorncliffe and Silkstone seams at 372, 410 and 480 yards respectively. There were two cages in the shaft each running on three wire rope guides. A balance rope was attached to the bottoms of the cages which, according to all accounts, ran with remarkable smoothness. The shaft was a large and there was ample clearance between the cages and the sides. To bridge the 12 inch gap between the cage and the mouthings on the insets, where there were two stagings, hinged sheets of iron were fixed to the edge of each staging. They were known as 'flags' and were fitted with two spikes which dropped into holes in the decks of the cages and so anchored it. The man in charge of the top stage, which was 6 feet above the bottom stage, gave the signals and was solely responsible for this operation. On the day of the accident, a cage containing 17 men, 12 on the top deck and 5 on the bottom was lowered from the Parkgate to the Thorncliffe seam, 38 yards below so that a man in the top deck could get off at the Thorncliffe and then the rest of the men raised to the surface. The man stepped across the space at the top staging without waiting for the flag to be dropped and the onsetter gave the signal for the cage to be raised without making sure that everything was all right at the bottom staging. In the mean time the onsetter on the bottom staging had dropped the flag without telling the top onsetter. The result was that the cage was raised by the engineman in response to the signal. It was held for a moment by the spikes of the flag and when it swung free, it oscillated so violently that it struck the girder of the Parkgate inset and another girder above before the engineman could stop the engine. Seven of the men were thrown out and fell to their deaths down the shaft. "Both onsetters were to blame for the accident, for both were in too great a hurry to get the cage away. The rope, capping and shaft fittings were in excellent condition and of first class materials and stood the enormous strain placed on them. This saved the lives of the rest of the men in the cage. The cage was crumpled with the impact and the fence chains at the ends broken, but it is quite possible that some of the lives might have been saved if the cage had been fitted with properly designed gates." "That the seven men met their deaths through negligence, being thrown out of the cage to the shaft bottom, owing to the flat sheet being fast to the lower deck when the cage was signalled off. The two hangers-on were guilty of carelessness and negligence, but not criminal negligence, and are very censurable." The ends of the cages were subsequently fitted with gates and it was noted that the agent had decided to do this before the accident.